In the ambitious OpenAIRE next phase, we’ll be working toward making Open Science the default in Europe. 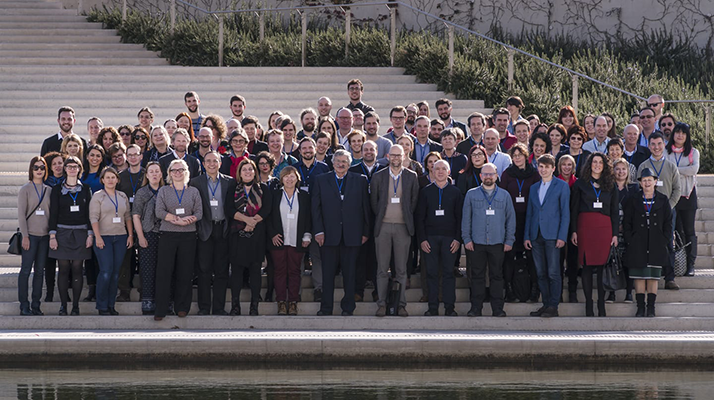 50 partners, 110 participants, gathered in Athens Greece for three days in Jan 17-19, to kick off the work on this timely continuation of OpenAIRE. OpenAIRE-Advance will continue to develop and extend OpenAIRE services, but most importantly it will consolidate national support for Open Science across Europe helping set the foundations of EOSC. The EOSC-hub project of 100 partners from more than 50 countries, mobilises providers from the EGI Federation, EUDAT CDI, INDIGO-DataCloud and other major European research infrastructures to deliver a common catalogue of research data, services and software for research. For researchers, this will mean a broader access to services supporting their scientific discovery and collaboration across disciplinary and geographical boundaries, reducing the fragmentation of the IT facilities and digital tools in Europe. OpenAIRE and EOSC-hub are in the process of formalizing a joint collaboration agreement so that their our integrated/interoperable services start shaping EOSC. Stay tuned! The consultation deadline for the the new Metadata Application Profile (OpenAIRE Guidelines for Literature Repositories v4), originally announced in October 2017, has been extended. We welcome repository networks, repository managers and other interested parties to provide feedback. Guidelines 4.0 will include a more diverse range of content providers - such as thematic and research software repositories, addressing interlinking of scholarly works to support the contextualization of research output, and semantic application via controlled vocabularies and thesauri supporting web-actionable URIs. A draft publication of the updated OpenAIRE Guidelines for CRIS Managers promises to make implementation easier. As of January 31st, 2018, the updated version has been completed. These Guidelines are intended mainly for implementers and administrators of CRIS’s who plan to communicate research information to OpenAIRE. They will provide compliance with both existing and emerging Open Access and Open Research Data mandates, while gaining additional visibility for the work of the researchers. We welcome feedback from the community on this updated version until the end February! We asked for feedback on the Horizon 2020 template for Data Management Plans. You responded! The survey, conducted together with the FAIR Data Expert Group, was launched over the summer of 2017 and had almost 300 respondents. Based on the outcomes, we evaluated how research and research supporting staff experienced the DMP requirements. They were asked about their general experience with the DMP template, specific questions about the guidelines and what could be improved, such as ‘What was their general experience?’ and ‘What could be changed to improve the process?’. Read about the outcomes and recommendations. Can research data be shared? Do the data protection rules clash with the principles of the Open Research Data requirements? This recently published study investigates two legal issues for the implementation of Open Research Data; data protection law and public sector information (PSI) and provides concrete policy recommendations. The core issues for Open Research Data and data protection are: Requirements for anonymisation (and harmonisation), reduction of requirements for consent, extension of specific research privileges, and definition of research purposes. The main issue for public sector information is the inclusion of university libraries in the PSI Directive.